There are a variety of calligraphy tools that you can use. 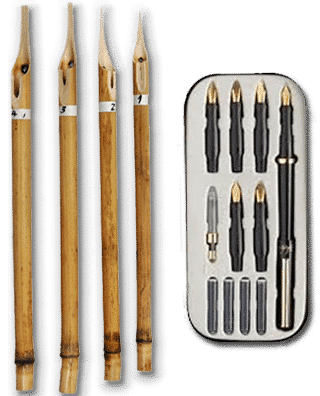 Calligraphy sets, felt tip pens, markers, fountain pens, and calligraphy dip pens which come normally with a flat tip. This will not work very well with Arabic calligraphy. The tip will be prepared by sharpening it and cutting it at an oblique angle of about 35-40 degrees. You can use any kinds of tools to be able to do those shapes to make sure that the pen can work well for Arabic calligraphy purposes. A reed pen, or “Qalam” in Arabic, is the traditional tool used for writing calligraphy. Arabic calligraphers prefer the reed pen over traditional one because its natural materials flexibility that allows for a better range of motion while writing. Reeds naturally grow in swamp areas and shallow waters. As soon as the reed is harvested, it is seasoned for four years by burying it in horse manure, chosen because it maintains a steady temperature. During this procedures the reed hardens and darkens and become perfect source for a reed pen. Chisel tip pen with a slanted tip.